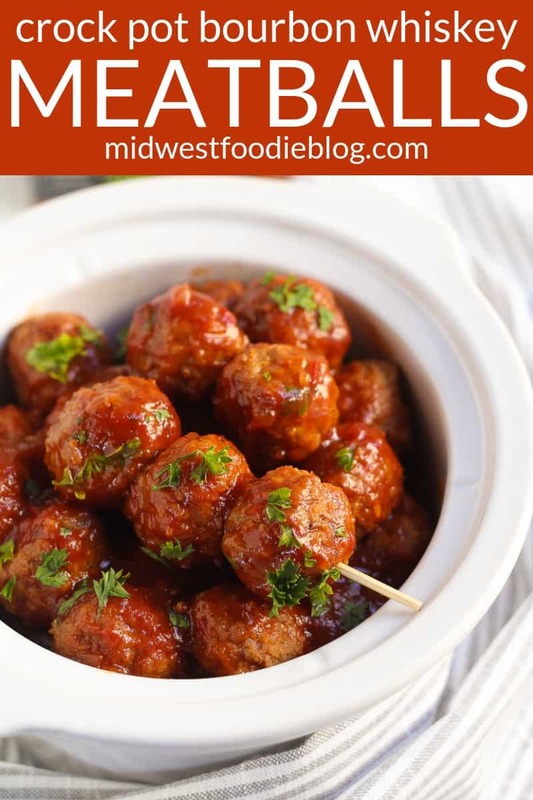 These meatballs are the perfect quick and simple appetizer for the holidays, football season or a Saturday night at home with the family! 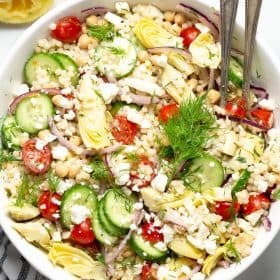 Everyone will be asking for seconds (and the recipe) so you’ll definitely want to make a double batch. 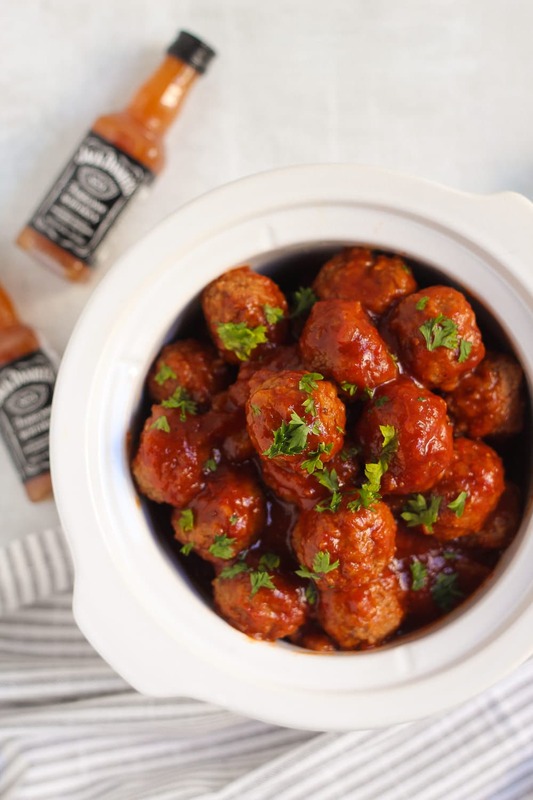 Bourbon whiskey gives these meatballs a punch but don’t worry, the alcohol will be cooked off by the time you serve them! Do I need to make my own meatballs? NO! You certainly could make your own meatballs for this yummy appetizer if you’re cool like that. But honestly, that’s just going to leave less time for snuggling, crocheting and watching cheesy Christmas movies (or football if that’s what you’re into). So I mean, do whatever makes you happy. And if it’s buying a frozen bag of meatballs (or 3) then let’s do that. This recipe is written for frozen meatballs, so if using freshly cooked homemade meatballs, you can reduce the cook time by at least half. Also, don’t worry about garnishing your meatballs with parsley if you’re not feeling it. I just needed to dress them up a bit as a bowl of brown meatballs doesn’t scream “delicious food photo!” Thanks for understanding. Do I have to cook meatballs before adding them to the crock pot? No, again! 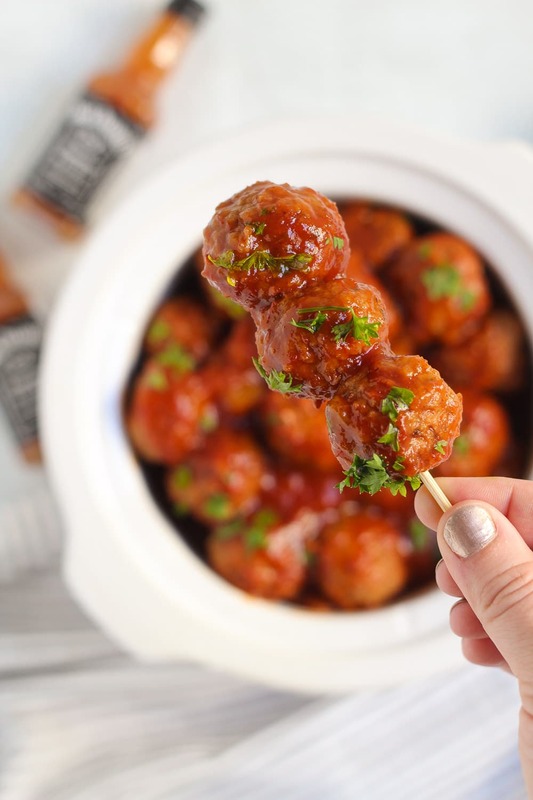 Frozen meatballs come fully cooked, so you are basically just warming them through and marinating them in a delicious whiskey bourbon BBQ sauce. Toss them into the crock pot frozen and two hours later they’ll be piping hot and ready to enjoy! Can I make these meatballs ahead of time? Yes! I like to mix the sauce ingredients in the crock pot insert and stick it in the fridge until I’m ready to start cooking. Then I just stir in the frozen meatballs, crank it up to high and let the slow cooker do the work. If I know I’m going to be short on time for cooking the meatballs, I will mix everything together (meatballs included) and refrigerate it all overnight. This allows the meatballs to thaw slightly, shortening the cook time. However, since most cooked meatballs packages say to keep frozen, I don’t usually let them thaw in the fridge for longer than 8 hours before cooking. 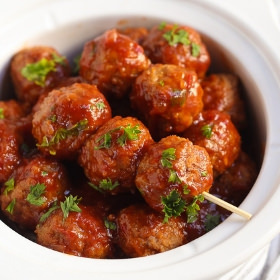 Should I use beef, turkey, chicken or pork meatballs? It’s totally up to you. I prefer the classic beef meatballs but any of the above mentioned meatballs will work. All the flavor is in the sauce you’re mixing up; the meatballs are just the flavor vehicle! Can kids eat these whiskey meatballs? Yep. The alcohol cooks off in the slow cooker leaving behind that toasty whisky flavor that warms you from the inside out. By the time the meatballs are ready to eat, there is no actual alcohol left. No one will get drunk from cooked whiskey meatballs. What should I serve with the meatballs? An ice cold beer! Or any of my other appetizer favorites. Those little bottles of liquor that you’ll find near the check out in the liquor department are 1/4 of a cup. So you’ll need three of those small bottles for this recipe. Better make it four bottles though, so you can make yourself a cocktail while you’re hard at work in the kitchen! Try a flavored whiskey for more flavor dimension. I’ve tried peach and apple whiskey in this recipe and both turned out great. Classic whiskey is delish but feel free to switch up and add some more flavor in there! These meatballs are a great “make ahead” appetizer. Stir all the sauce ingredients together in the crock pot insert and refrigerate. When you’re ready to cook everything, stir in the frozen meatballs and cook according the recipe directions. The easiest appetizer you’ve ever made, these meatballs will have your friends and family asking for seconds (and the recipe)! Combine all sauce ingredients in a medium/large slow cooker. Stir until everything is well mixed. Add meatballs, cover and cook on high for 2 hours (or low for 4 hours) or until meatballs are heated through. Serve with toothpicks, because who doesn’t want to eat meatballs with toothpicks?! 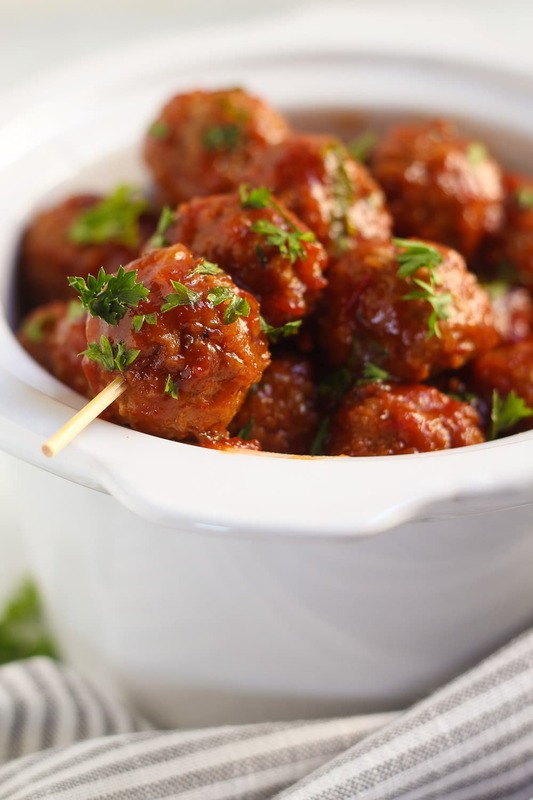 The easiest meatball appetizer you’ve ever made – this recipe is definitely a keeper!